With two days of good weather in the forecast, it was time to actually get something done in Glacier. The park contains 6 peaks over 10,000 feet; given seasonal road and trail closures, and difficult stream fords, only three looked reasonable: Jackson, Cleveland, and Merritt. They all required an unfortunate drive around to the other side of the park, but west-side peak-bagging options seem limited. Jackson looked like a moderate day on paper: about 20 miles and 5-6000 feet of elevation gain, so I chose to do it first. 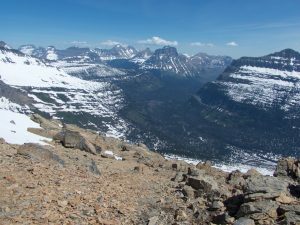 Going-to-the-Sun road was closed at the Jackson Glacier Overlook, so I slept there, then got a semi-lazy start toward Gunsight Pass. 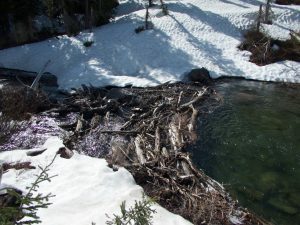 I had checked on the park’s website that the crucial suspension bridge over Reynolds Creek had been installed, and assumed that the popular trail toward Gunsight Pass had been at least partly cleared, as it had on the other side below Sperry Chalet. Unfortunately, I was badly mistaken: the trail beyond the bridge has not been cleared at all, and the next four miles through an old burn had probably over 100 blowdowns. This turned what I thought would be a mellow day into something of an ordeal. On the other hand, it kept most people away, and possibly the grizzlies as well, since most animals aren’t stupid enough to plow through such a steeplechase course. I saw some very fresh grizzly and moose tracks, and a fair amount of manure, but did not catch a glimpse of either. Things finally started sucking less as the trail climbs out of the Saint Mary River valley beyond the Florence Falls turnoff. The snow was nicely consolidated, and I made good time to where another suspension bridge should cross the outlet of Gunsight Lake. Unfortunately the “bridge” was just a pile of slats on the near bank, and I could not figure out how to assemble it myself. The ford looked reasonable, but I did not relish the thought of climbing out barefoot onto the snow on the other side. Fortunately, there was a nice log-jam about a third of a mile downstream, so I did not need to subject myself to that ordeal. Beyond the log-jam, I kicked steps uphill through the woods in 3-4 feet of consolidated snow, which was probably faster and easier than whatever the ground looks like in summer. Once out of the trees on Jackson’s east ridge, I preferred the underlying rock and scree to the somewhat softer snow, angling up to a random point on the ridge. 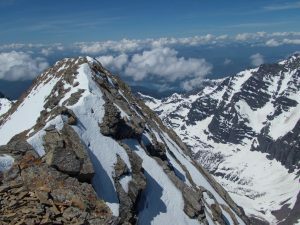 The crest itself was mostly snow-free, with only a few deviations necessary from the cairned summer route. The angle of the rock layers makes the ridge a ramp rather than stairs, and the rock is sticky enough to easily walk up the slabs. 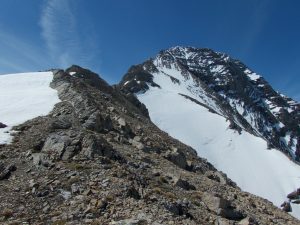 I traversed to the far end of the summit ridge, where I finally found the summit cairn and “register,” a chewed-on Gatorade bottle with some wet scraps of paper and a $20 bill (score!). With clean air and a few high clouds, the view was spectacular, encompassing the entire park, including all of the other 10,000 foot peaks, from Stanton just south, to Cleveland far to the north. 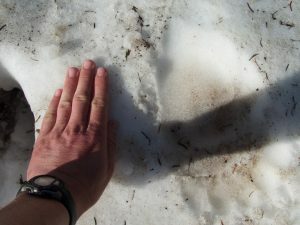 I think late May or early June is the best time to visit Glacier: not only does the snow make cross-country travel in the woods easier, but it hides the corpses of its dying glaciers. I scrambled back along the ridge, then had a quick plunge-step and boot-ski down to the woods, definitely much faster and easier than scrabbling down the dinner-plate talus. As I crossed my bridge and descended toward the Saint Mary valley, I steeled myself for the miserable log-hop and climb back to the road. 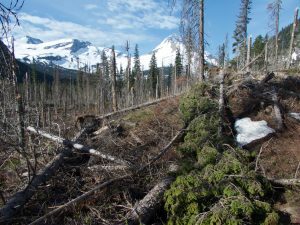 Though I once again saw no animals — not even a moose in the expansive swamps — I was surprised to meet two guys who had nearly passed the wretched part of the trail on their way to Gunsight Lake. They had apparently chosen poorly when picking out a moderate dayhike on a long road trip from Arizona. I was impressed by their tenacity, and encouraged them by letting them know that they were almost through the worst. I finished the grind up to the trailhead mid-afternoon, encountering a steady stream of tourists driving up to the road closure, taking a few photos, and driving back down. I also met a couple of local skiers hiking down the road, which was supposedly closed to hikers. I asked them where they had skied, but despite the skis obviously attached to the top of my car, they were absolutely unfriendly and vague — oh well. I ate my beans in silence, then drove on to the next.